Tile provides a beautiful and easy to clean surface that many people place on floors, walls and even ceilings. Homeowners place different types of tile inside and outside their homes. Some homeowners use one tile color and lay the tile in a traditional checkerboard pattern that requires no pre-installation planning. Other homeowners desire to create more distinctive patterns using tiles of different colors, shapes and sizes in custom patterns. For those looking for an extraordinary flooring pattern, do not wait until you start installing the floor; have a design ready to guide you through the installation. Turn your floor into a work of art. Measure the length and width of the room or space you wish to design the tile pattern for. This helps you to determine a scale for your pattern grid. To make your pattern easier to view, represent each square foot of the room as a 2-inch by 2-inch square on your poster board. For example, if the room measures 12-feet wide by 14-feet long, then you should draw an outline on the poster board that measures 24-inches wide by 28-inches. Use the ruler and pencil to draw this outline with straight lines. Measure any obstacles in the room that you must apply tile around and not under. If designing a tile floor pattern for a bathroom, measure the approximate length and width of the bathtub, shower, toilet and sink. If designing for a kitchen, measure the approximate length and width of cabinets and islands. Use those measurements to place those structures and fixed objects on your poster board outline. Do not worry about drawing perfectly to scale, approximate size and placement are fine. Choose sizes and shapes of tile to use in creating your pattern design. You may also draw random designs and buy tile later that fits your design. Measure the tiles to scale the dimensions down to your poster board floor plan. Remember that each 2-inch distance on the poster board reflects 1-foot of actual distance in the room, so you will represent a 6-inch square tile on your poster board as a 1-inch square. Use a ruler to draw in the shapes and sizes of each tile. Draw one tile at a time, especially if you plan to use different sizes and shapes. Use a protractor to keep the angles on your drawn tiles as close to the angles on the tiles as possible. Get creative with your pattern. You may have to erase and re-draw lines several times as you consider different pattern options including setting the tiles on a 45-degree from the room entrance, brick laying patterns, solid rows of different sizes and colors and positioning rectangular tiles to point in alternating directions. Color the completed tile layout pattern with coloring pencils or crayons. 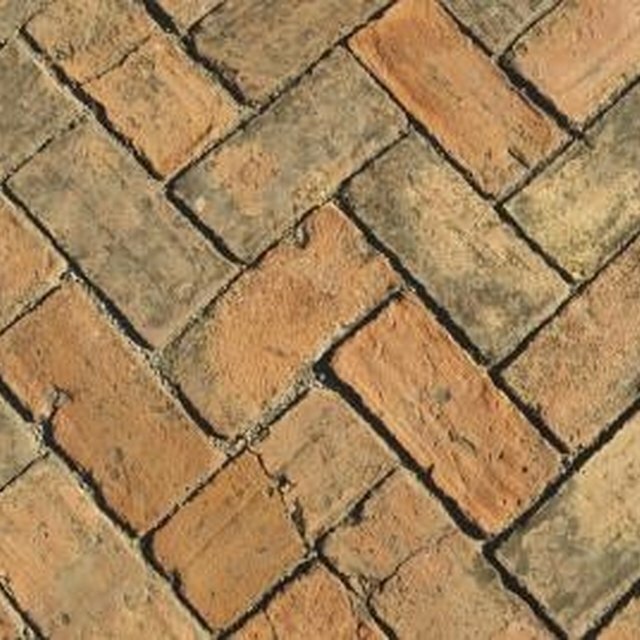 Alternating the placement of different colored tiles also helps to create a distinctive tile pattern. You can even make a simple checkerboard pattern appear more detailed and intricate by creating a color pattern in the tile floor.